We’d love your help. 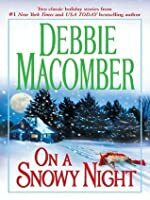 Let us know what’s wrong with this preview of On A Snowy Night by Debbie Macomber. To ask other readers questions about On A Snowy Night, please sign up. For people who like contrived plots and unmemorable, cliche, irritating characters then Macomber's romance novels are the way to go. For the rest of us, skip them and save some time. another great book by Debbie. I love Christmas books. I m glad that Noelle and thom a their mom's got back together. highly recommend. The first book The Christmas Basket was just okay to me. I really liked the second story The Snow Bride much more. I only gave it three stars because of The Snow Bride which I did enjoy. Thus book had two stories. I'm giving it 5 stars because of the first story - The Christmas Basket. I loved the characters and laughed out loud at the feud between the mothers. So much fun! This book actually contains two stories that were originally published individually as gift hardbacks - The Christmas Basket and The Snow Bride. There has been a feud between the matriarchs of the McDowell and Sutton families for years, one that was made worse when Noelle McDowell and Thomas Sutton planned to elope ten years ago - before Thomas jilted her. Noelle has avoided returning to Rose, Oregon since then but now her younger sister is getting married she is retur This book actually contains two stories that were originally published individually as gift hardbacks - The Christmas Basket and The Snow Bride. There has been a feud between the matriarchs of the McDowell and Sutton families for years, one that was made worse when Noelle McDowell and Thomas Sutton planned to elope ten years ago - before Thomas jilted her. Noelle has avoided returning to Rose, Oregon since then but now her younger sister is getting married she is returning for Christmas. Noelle thought her feelings for Thom were all in the past, but a chance meeting gives them a second chance at love. I really enjoyed this story! The characters were well developed, and the past circumstances that gave rise to the story are gradually revealed which helps add tension to the story. The clashes between the two mothers, Sarah and Mary, are absolutely hilarious, and being able to see from both Noelle and Thom's perspectives helps the story flow. I also loved how the story doesn't always take the obvious path, giving rise to some twists and turns. Jenna Campbell has always been responsible, but after meeting Dalton Gray in a poetry chatroom she's decided to take a chance and fly up to Alaska to meet him. However her seatmate Reid Jamison decides to kidnap her in order to save her from herself, and the next thing Jenna knows she's stuck in tiny Snowbound, Alaska with a massive blizzard about to blow into town. This is the story I brought the book for as it sounded like a cheesy but cheerful Christmas read. It's definitely cheerful and Christmassy, but not cheesy. The lead characters Jenna and Reid are amazing, but their story is given real depth by the supporting characters who also live in Snowbound and Jenna's scatty LA-based mother. The romance is well-developed and not of the standard leap-in-to-bed kind, and the gradual emotional developments between Reid and Jenna are sweet and well-paced. Both stories are short and sweet (the whole book is only 370 pages) and are perfect Christmas reads. The only thing that lets this book down is it's cover which just isn't up to the standard of the stories. A fun light read during a busy holiday season. Two stories: The Christmas Basket & the Snow Bride. Enjoyed both of them. Lightweight and easy to read. The first story is actually probably worth 4 stars, but the second story was absolutely terrible. I used to enjoy Ms. Macomber quite a bit. She still writes just fine as far as a clean and simple world building. What I'm not enjoying anymore and it could be my changing tastes, are her characters. The conflict for her characters seem to be miscommunications. The petty games people play when they are in a "huff". The characters are what I classify as juvenile and depressingly immature. It reminds me of the show, "Threes Company". All these "bad" things happen and are blown out of proportion be I used to enjoy Ms. Macomber quite a bit. She still writes just fine as far as a clean and simple world building. What I'm not enjoying anymore and it could be my changing tastes, are her characters. The conflict for her characters seem to be miscommunications. The petty games people play when they are in a "huff". The characters are what I classify as juvenile and depressingly immature. It reminds me of the show, "Threes Company". All these "bad" things happen and are blown out of proportion because people are not listening or communicating with each other. Or worse, there's a person who specifically plays games. Since Ms. Macomber is writing contemporary, I can believe there are people who are unfortunately this petty. I avoid those people because my urge to slap them up side the head is too great. Since there are enough people in real life this way, the last thing I want to do is read about such irritating people. In the Christmas Basket, Noelle and Thomas's star cross lover situation was basically 10 years of wasted time due to a petty fight between mothers and stupid misunderstandings. Lovely. Noelle came off as a whiny, insecure, low self esteem nut case. If I were a man, I wouldn't want her either. Thomas actually seemed normal. Poor guy stuck with a woman who is juvenile and petty. In Snow Bride - Reid has mommy abandonment issues and Jenna decides "hey, internet dating is great. I'll meet the man of my dreams in a chat room." She quits her job to meet Dalton. People who do this, I have no sympathy for when everything becomes a cluster F.
One of Debbie Macomber's Christmas gems! On a Snowy Night features two of her Christmas stories in one book. In the Christmas Basket, two star-crossed teenagers bear the brunt of their mothers' rivalry. A Silver Tea set sparked a fued between two friends that affected a whole community and their two kids, Noelle and Tom. Can a Christmas Miracle and the love of these two star-crossed lovers repair the friendship between Mary Sutton and Sarah MacDowell? In The Snow Bride, thirty-something executi One of Debbie Macomber's Christmas gems! On a Snowy Night features two of her Christmas stories in one book. In the Christmas Basket, two star-crossed teenagers bear the brunt of their mothers' rivalry. A Silver Tea set sparked a fued between two friends that affected a whole community and their two kids, Noelle and Tom. Can a Christmas Miracle and the love of these two star-crossed lovers repair the friendship between Mary Sutton and Sarah MacDowell? This was a collection of two Christmas romances. The first one was about Noelle and Thom who were high school sweethearts but through a misunderstanding believed that each had chosen their family over their relationship. Ten years later, Noelle returns to her home for her sister's wedding preparations and meets upp with Thom again and the sparks fly immediately in many different ways. The second story is about Jenna, who is 31 and has determined that her life is boring and she is getting nowhere This was a collection of two Christmas romances. The first one was about Noelle and Thom who were high school sweethearts but through a misunderstanding believed that each had chosen their family over their relationship. Ten years later, Noelle returns to her home for her sister's wedding preparations and meets upp with Thom again and the sparks fly immediately in many different ways. The second story is about Jenna, who is 31 and has determined that her life is boring and she is getting nowhere in the romance department. She meets Dalton in a poetry chat room and decides to leave her home in California for this man after 4 months. On the flight there she meets Reid who knows Dalton and has some very poor things to say about him. Reid agrees to fly Jenna to Dalton's town when Dalton does not arrive to pick her up at the airport. Reid kidnaps her and takes her to Snowbound to try and convince her to not meet Dalton. They get stuck there during a snowstorm and they get to know each other better. If you want a cosy, undemanding read, this is the book for curling up on the sofa in front of the fire on a miserable day. I did not realise that it is in fact two books in one, and the first is definitely the weaker - I did wonder how on earth it could be spun out to nearly 400 pages. On its own it would probably only have rated 2 stars. It is slight story of two former High School sweethearts who each think they have been jilted by the other, until they meet up again ten years later. They still If you want a cosy, undemanding read, this is the book for curling up on the sofa in front of the fire on a miserable day. I did not realise that it is in fact two books in one, and the first is definitely the weaker - I did wonder how on earth it could be spun out to nearly 400 pages. On its own it would probably only have rated 2 stars. It is slight story of two former High School sweethearts who each think they have been jilted by the other, until they meet up again ten years later. They still have to deal with the fall out from their mothers who are conducting a childish feud which did get a bit tiresome. the two stories were short. I liked the plot line of the story, stories of love misunderstanding, and meeting people who you first don't get along with but fall in love with later does not bore me, but because of the compact-ness of the two stories I feel like the ending was rushed , the getting to fall in love with each other was rushed and things were explained quickly, and it all just followed some sort of happy ending formula. this applies more to the second story, and semi to the ending of the two stories were short. I liked the plot line of the story, stories of love misunderstanding, and meeting people who you first don't get along with but fall in love with later does not bore me, but because of the compact-ness of the two stories I feel like the ending was rushed , the getting to fall in love with each other was rushed and things were explained quickly, and it all just followed some sort of happy ending formula. this applies more to the second story, and semi to the ending of the first story. -The Christmas Basket (2 stars at best) which was really extremely bad, poorly written and awfully predictable. But it was so bad it ended up being funny and I kinda enjoyed reading it. Two stories in one book. The Christmas Basket Noelle (born on Christmas Day) and her high school sweetheart, Thom finally learn the truth about what happened 10 years ago when they had planned to elope. The Snow Bride. Jenna Campbell has met someone on the internet. He lives in Alaska, she leaves her job and heads out for an adventure in Alaska. Her new friend doesn't appear at the airport so she gets a pilot to take her to Dalton's home. She ends up snowbound in Snowbound, Alaska. Love is found Two stories in one book. The Christmas Basket Noelle (born on Christmas Day) and her high school sweetheart, Thom finally learn the truth about what happened 10 years ago when they had planned to elope. The Snow Bride. Jenna Campbell has met someone on the internet. He lives in Alaska, she leaves her job and heads out for an adventure in Alaska. Her new friend doesn't appear at the airport so she gets a pilot to take her to Dalton's home. She ends up snowbound in Snowbound, Alaska. Love is found in the small town.............some comes as a surprise!! This book consists of two small stories, the first is The Christmas Basket. It was a fun read about 2 families thrown back together after years of fueding. 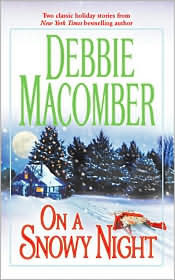 this was the first and last book of debbie macomber i read.really i got kicked up after reading such a book.on my friend's recommendation i thought this would be nice but it was a disaster.both the stories were not upto the mark.i thought that this would be of romance but i couldnt see a hint of romance the first story.second one was better i could say but after this i didnt even wanted to see her books. Two short novellas in one, both based on Christmas themes. Very nice light reads. Enjoyed them both. Of course, wish that both had been separate novels instead of novellas. Somehow I feel small novellas does away with the plot development and character development, which is more easily done in a full length novel. Despite all that, if you want a quick cozy read between books, this one's definitely for you.